Why do you want to join the server? What is your planned faction to join (You can change this later)? Im not a noob going "UMG U HAXER NAWRB" and I alot of friends older than me I act mature too. 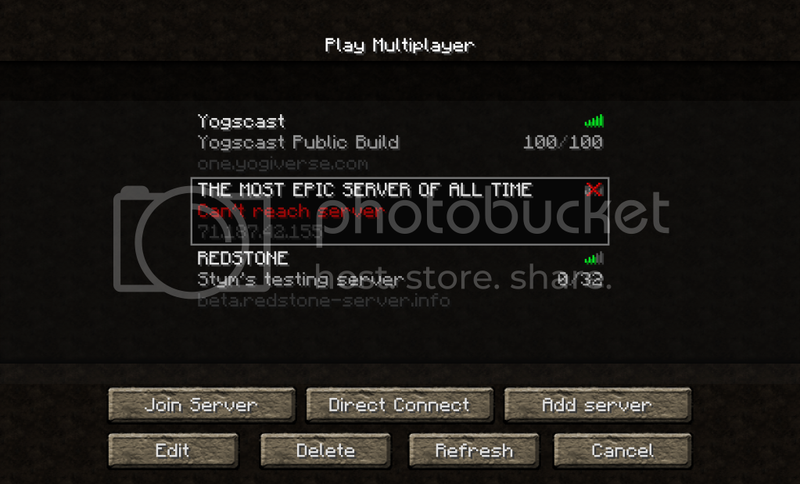 \You should have the players names listed and how they are like on the server. ex: Cuzicoolikethat, The castle general. This is my sigature, don't touch it. Suggestions: I think you should limit the amount of jobs people hold, or else they'll just join all of them. IMO, anywhere from 1-3 is a good choice. Also, mcmmo :tongue.gif: . Its a good plugin for any RPG server. Hey, can you please PUT THE SERVER UP? I need another Message with the server ip in it, I didn't get the first time. I don't see why nobody else is saying anything about the server being down. EDIT: 3 DAYS NOW, NO WORD? I have been playing minecraft since May. I have been looking for a good server to play on since its gets a little dull when playing by myself. I would actually want to create a group of forest rangers. Yes I think I am mature since i do community service. Why do you want to join the server? I've been looking for an interesting RPG server that has PVP for ever. What is your planned faction to join (You can change this later)? I plan on making a faction with a group of my friends that are going to come play with me. I can list their names if needed. Do you think you are mature? Yes. I know when to be funny and when to have fun. PS: I am a good friend of Shquapp and I am interested in making a faction with him. This is how sad I am. How long have you been playing minecraft? I have been playing Minecraft for maybe... 4 months or so? Why do you want to join the server? I want to join because I have never been on a server with other people. What is your planned faction to join (You can change this later)? I do not know yet, maybe Fief's. Yes, I've been called mature by many and hang out with mature people. All jokes aside, The server has been down, i have been aware. This is because me and my dedicated server's power went out, so that means the server shut down. The power is back up now, so the server is up. Hi, I would like to join your server. I was looking for a survival/RPG server, and this is just that. Yes, I am mature, I can't withstand people who aren't. English is not my native language, so there could be mistakes. How old are you? 17 hope thats ok ? Btw, If you are looking for Builders, Ops, Mods i am very good at all these jobs i have been all of them in past servers i have been in. How long have you been playing minecraft? About a year. Why do you want to join the server? I'd either like to make a faction or join one. What is your planned faction to join (You can change this later)? I'm not sure perhaps Assassins if its made. Do you think you are mature? (ex: I know i am mature because i can spell properly with full grammar.) Yes, as not only do I spell properly I never really to to either annoy or offend. ASSASSINS is not made, And it is not really a faction, it would be a group. Marinthia is the starting faction so i'll put you in that. Everybody can join that is whitelisted now, since the power is back up. Sorry guys, It appears there was a problem with the internet again on my server. It was up all night yesterday, and I was wondering why no one was on. I think i found the problem, and will fix it within the hour. Please try connecting in about 1-3 hours, as it will be up by then. Alright guys, I changed some stuff on the box, and I believe it was the IP that is the issue. The server is up, and I will be re-sending the IP. Yeah, I think the new IP fixed it. If not, just tell me on a reply. Medieval RPG is currently a WIP RP server for the game minecraft. There is going to be Jobs, different factions, and wars. There are things like Fiefs, Kings, Lords, and more! as a peasant, just a mere fly. Your job is to join a faction, (or make one) and get a job. A new feature is that YOU CAN MAKE groups and factions. A group can be a simple hideout called for example, the assassins. Go on to the website for more details. I would like to join the server because I have heard about how great it is from my friends. I have been playing Minecraft since the first beta release. I think I am mature because I have never been banned or kicked and I use good grammar. I did not join through the website.